Andrew B Holmes – The Official Blog for British artist Andrew B Holmes. Andrew B Holmes recent work. Over the past year, Andrew has been juggling working on new projects with moving house and – rather more dauntingly – his studio. Now unpacked and settled into his interim workspace, Andrew has been free to forward some more recent works to a few independent galleries. He has finally also had more time to update this blog and provide a link to his new website. For several years, Andrew has been collaborating with Kat Kowalewska, a curator who also relocated last year – in Kat’s case, to enjoy the sea air, light and beaches of Cornwall where she has already met several new local artists working in various disciplines. However, she continues to liaise with a number of galleries in London and Andrew was particularly pleased to be invited to submit some of his “In Water” works and studies for Kat’s ‘Paintings for Spring’ show curated for the Aubergine Gallery in Wimbledon. In this exhibition, Kat has included a selection of collectable St Ives style pieces from Fish Pye Pottery, crafted by Laura McCrossen, together with some paintings from Cornish based artists Tracy Oldham and Edwina Broadbent not to mention Gary Long – an artist Kat has shared a longstanding professional relationship with. Also exhibiting in this show at The Aubergine Gallery are works from several regular artists – Sarah Ollerenshaw, Tanja Moderscheim, Hannah Davis, Catherine Forstall, Jane Askey and Emma Dunbar. The ‘Paintings for Spring’ Exhibition opened on March 22nd and runs through until early May. © Andrew B Holmes 2019. All Rights Reserved. The New English Art Club (NEAC), established in 1886, is part of the Federation of British Artists and they are currently holding their annual exhibition at the Mall Galleries in London. The show represents members’ work along with up to one hundred non-member submissions chosen from over two thousand entries. Member artists and the submitted works encompass many different techniques in various mediums and the exhibition provides the visitor with an interesting and diverse collection to view. “The New English Art Club is a group of around ninety professional painters whose work is based principally upon direct observation of nature and the human figure. We aim to foster excellence in all our activities and continue to assist and encourage the art of painting to develop even more expressive possibilities. Over the past 18 months, Andrew has been exploring how we assimilate the divergence of information that we receive through so many media outlets, all promoting differing opinions and agendas. These influences can include: an obsession with celebrity status, fashion, luxury and wealth, but equally, everyday needs and desires, implications of political choices or even, desperate images of natural disaster. Alongside this, we see remarkable new discoveries and extraordinary achievements. Andrew initially decided to paint a collection inspired by found pieces as backgrounds for some of his figurative work. Apartment 31 started out as a study piece painted on paper in 2017, which Andrew then decided to submit to the NEAC as a stand alone piece. The member judges alter each year and so the work they select will vary accordingly which means that each annual show will offer a different dynamic. However, the group’s aim continues to be based on a strong appreciation for enquiry and observation and this clearly provides incentive for that further development. In regard to Andrew’s painting – Apartment 31 – he discovered that a large amount has been written over the years about the “aestheticization” of ruins. Critical studies discuss the obvious historical, socio-political points of landmark sites, with fascinating accounts documenting, for example, the fall of Rome. Throughout the centuries, accounts of these have, in particular, ‘framed’ obsessional levels of landscaping to satisfy fashions such as the “picturesque movement” and as a consequence, follies were imagined and built to recreate this love for such nostalgia. Now, with so many media outlets available, we are regularly being exposed to images of both natural and sadly man-made destruction – in areas of conflict and war, entire cities and their populations have been impacted. Seeing the demolished buidings, the derelict communities and the desolation of peoples lives then broadcast all over the world. This turmoil has not unfolded over decades or centuries but within a matter of days, weeks or months at most and the information is fed back with the all the immediacy that modern media technology provides. In this, lies a concern that with the abundance and regularity of such brutal imagery, our emotional responses no longer react or relate – the impact doesn’t alarm us and we are becoming increasingly impervious to these sights. In Apartment 31, the floor levels appear to have folded in layers, leaving twisted steelwork dangling precariously and yet these look more like threads attached to pieces of card. The exposed rooms – seemingly empty of any evidence of everyday life – as the monotonous, grey concrete dust coats and flattens any traces of what used to exist or of who resided here – leaving only a barren monochromatic scene. Andrew is currently exploring the use of employing more abstracted language in examining how this can alter our experience and our initial and emotional perception. As our concept of these complicated socio-political issues become increasingly abstract, it’s clearer to see why modern representational art can often achieve more impact by employing a more abstracted vocabulary. An excellent example of this is in Robert Motherwell’s abstract documentation – ‘elergies to the Spanish republic’ – where he documents his experiences of the Spanish civil war. Please see a link to the Levy Gorvy 2016 Exhibition, together with Stella Paul’s essay on Abstract Expressionism taken from the Met Museum’s Educational Dept site listed below. Many well known artists, writers, poets and filmmakers have applied their craft to try to engage with these subjects, highlighting the analogous sense of the modern human condition and our fragility. 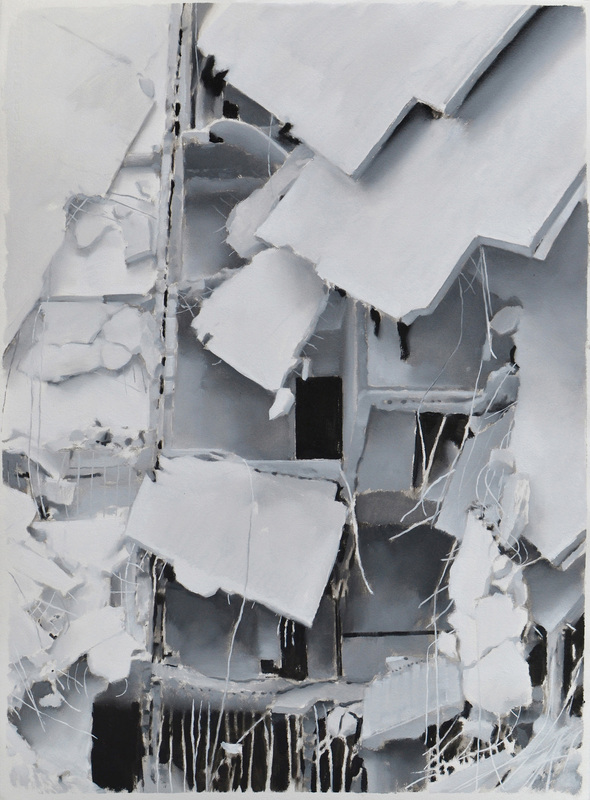 Within the process of further investigating this concept, one piece Andrew painted: Mia (after Lely) – called in to the Columbia Threadneedle Selection in 2017 – included one of his generic figures in the foreground against a darkened background of rubble and collapsed buildings. The NEAC 2018 annual show runs from 15th to 23rd June at the Mall Galleries in Central London. Andrew was obviously very pleased to hear that his work had been selected and Apartment 31 is in the north Gallery, on an area of wall of other monochromatic pieces and these complement one another well. Members work can be purchased via the NEAC website, (see link below), and enquiries can be made directly to the Mall Galleries for any other pieces. The Preview last Thursday was very well attended with an excellent introductory speech from Sir David Clementi – chairman of the BBC. The club run an active and varied education programme, they award two scholarships each year and offer continued support and valuable opportunities for artists and collectors alike. © Andrew B Holmes 2017. All Rights Reserved. Last week, Andrew attended the Artists’ Previews for the ING Discerning Eye Exhibition at the Mall Galleries, as well as the final selection of works from The National Open Art Competition (NOAC) at The BargeHouse, Southbank. Both exhibitions include works from a broad range of mediums and this definitely adds to their dynamics, providing the visitor with a rich and varied experience, and we were pleased to see that both previews were very well attended. At the Discerning Eye Exhibition, if successful in getting work accepted, one can then look forward to visiting and discovering which selector has chosen the pieces and how these are displayed. 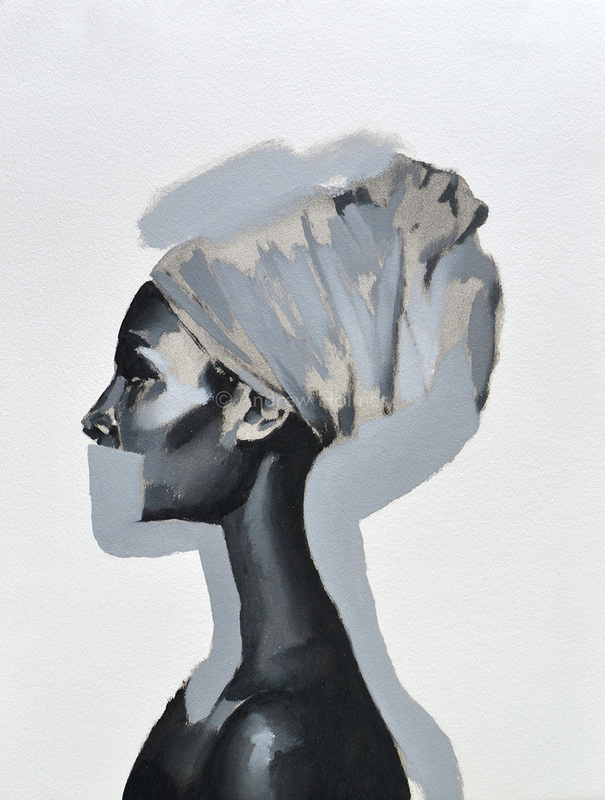 It is always intriguing and, this year, two sketches, ‘Taya’ and ‘Auba’, were selected by one of the collectors, Ellen Bertrams whilst the artist, Anne Magill, chose Andrew’s piece ‘Untitled figure (sketch 01A)’. Interestingly, Discerning Eye are one of the few shows who do not advise the artists of any awards prior to the exhibition, therefore, Andrew was equally surprised and delighted to discover that his ‘Study of Taya’ had been selected for the ‘London and South East Regional Prize’. He’s extremely honoured to have had his work chosen from so many very accomplished pieces. Inevitably, the diversity of work provides an inspiring environment. The artists enjoy meeting up at these events: the chance to celebrate all their hard work – often undertaken in isolation – allows for an exchange of experiences and much discussion on the work, the process and their frustrations! It is a great opportunity to encourage the further development of their skills and ideas. The paintings Andrew has been exhibiting in these two shows are representational studies of individual subjects. Each piece is based on his intuitive observations where he explores these ideas in the application and painting techniques. On close inspection, the hand of Andrew’s work is evident in all these paintings. However, where the execution is looser and less finished in the study pieces – shown here in his human figurative work – by their nature these become more enigmatic. Andrew hopes to achieve an ambiguity in the sketches; his aim is to examine our initial reactions to any of his figurative work. How we view aesthetic elements and respond differently are key elements in Andrew’s process which he constantly refers back to, in particular, considering the role of context. The 21st NOAC venue this year is fabulous. Laid out over several floors, each space has an individual style and the excellent hanging of pieces most certainly deserves a mention. Alongside the show they are running a range of very interesting events and workshops throughout the week. 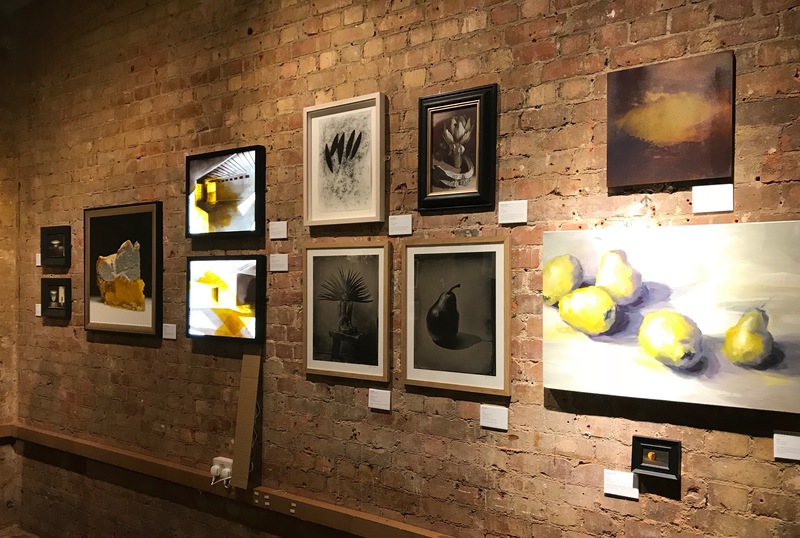 Andrew’s ‘Lemon Meringue’ is beautifully displayed alongside ‘Pear’ by Tif Hunter, ‘Dusk I and II’ by Grace Ayson, ‘Forest Trail 1’ by Belinda Bailey and two small oil painting on boards by Fiona Bradford to name just a few, but there really is so much more to see here. A particularly special element of the NOAC is the Under 16’s category. There are few opportunities for this age group to participate alongside the major shows and the artwork selected is quite remarkable, beautifully observed and utterly charming. ‘Pearl’ by Molly Bulmer aged 12 yrs and ‘Tiger’ by Claudia Scholes aged 4 yrs. The Graduate Prize went to Harriet Fawcett for her Photographic piece ‘Ersatz 2017’, a focus on the decline of the bumblebee and this was very well deserved. Entrance to each of these venues is free and they are well worth visiting as the work available to view has been selected by panels of accomplished artists, gallerists, collectors and critics, and is easily comparable with the exhibits in the RA Summer Show – a view supported by the critic, Simon Tait (please see links below). However, there are only a few days remaining to visit these exhibitions as the two shows will be closing at 5pm on Sunday 26th November. 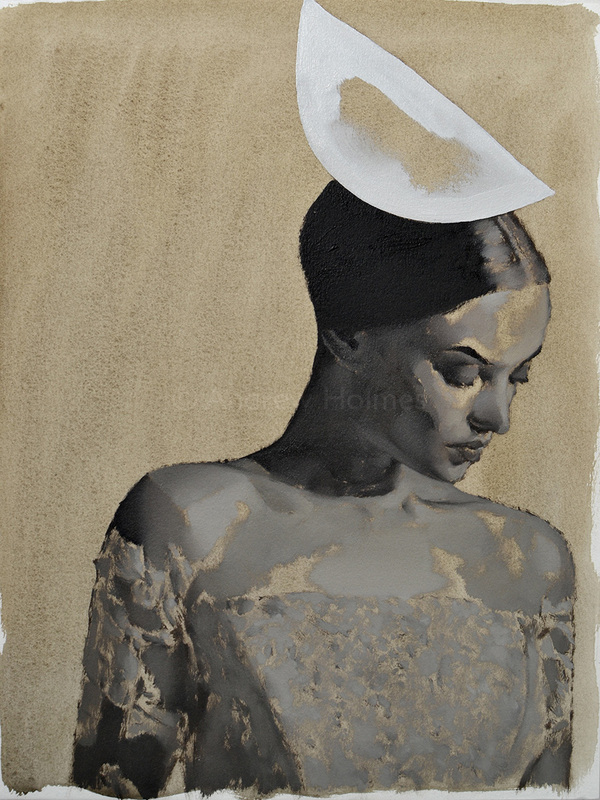 Three new figurative studies have been selected by Panter and Hall for this year’s Autumn Affordable Art Fair, (AAF). Held in Battersea Park, the show will open with a Charity Private View in the evening on Wednesday 18th Oct 2017. The autumn is often a busy time for Andrew, with several interesting exhibitions coming up and he is delighted to have some of his newer figurative pieces showing with Panter and Hall at this fair. The AAF officially opens to the public at Battersea Evolution in Battersea Park on Thursday 19th Oct, and runs until Sunday 22nd Oct 2017. Please see below for further details. The main gallery for Panter and Hall is based in Central London. The selection process for this year’s Discerning Eye Exhibition is now complete and Andrew is delighted that he will have three new paintings included in the show. Sponsored by ING, this is a show of small works in various mediums and is always very exciting. All three pieces to be included in this year’s hanging represent more of Andrew’s figurative work; an area within which he is keen to further develop fresh ideas and techniques. It is always a daunting prospect for an artist to offer up their paintings for judgement in the public sphere. However, as mentioned in previous posts, submitting work into a show can, in fact, be a useful tool for an artist to gauge reaction, and where this exhibition differs is that the broad variety of curators also put together their own individual selections further contributing to the show’s vibrancy and variation. Andrew wanted these new works to be muted and uncomplicated. The more monochromatic approach of these images simplifies the decision-making process; where he can focus on the application of the paint, the marks and the tone and by using a limited palette, Andrew is able to concentrate more on the physical aspect of painting. The Exhibition takes place in November at the Mall Galleries in Central London. Artists: Elmo Hood and Anne Magill, Collectors: Ellen Bertrams and Miranda Richardson and Critics: Nicola Coleby and Simon Tait. The 2017 Discerning Eye Exhibition will be open to the public from Thursday 16 November until Sunday 26 November, between 10am and 5pm daily, at the Mall Galleries, The Mall, London SW1. Admission will be free and all the works will be for sale. We now have to wait for the show to open in November to find out who has selected Andrew’s work for their wall in this year’s exhibition. 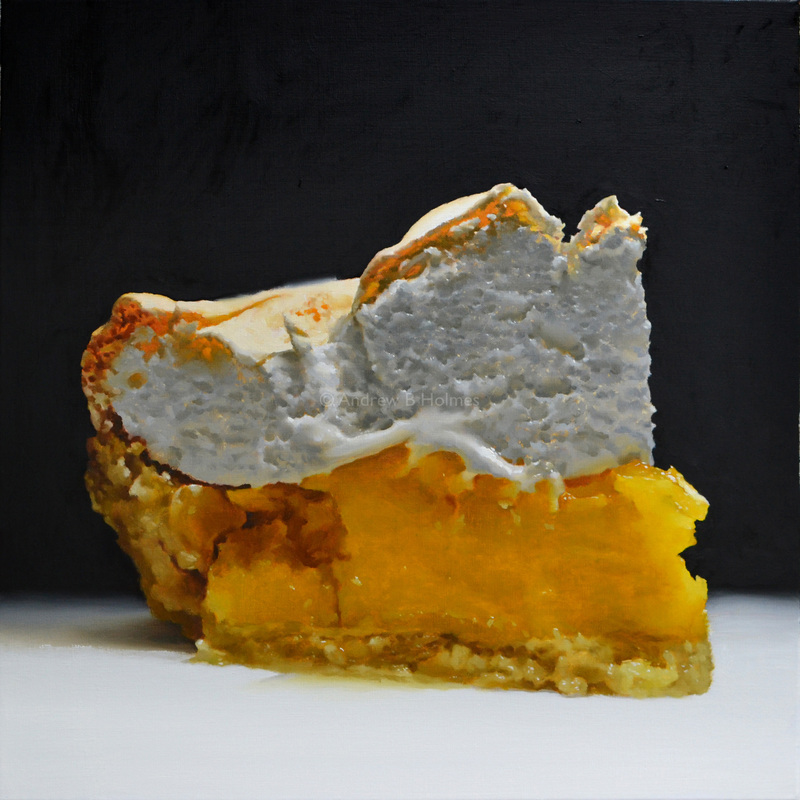 Andrew is very pleased to hear that a still life he painted earlier this year – ‘Portrait of a Lemon Meringue’ – is to be included in the NOA, (National Open Art), 2017 Exhibition. Professional and amateur artists aged 15 and over have submitted works in a variety of mediums and each entry has been judged anonymously, making the competition one of the most democratic in the UK and Ireland operating today. Overall, this exhibition has a strong contemporary style. However, more conventional pieces sit well within the show. This diversity in the range of works selected provides an interesting view on where the process of combining traditional techniques with a more explorative approach can offer new ideas. Bridging these areas of study has always held Andrew’s interest, when developing his abstract, figurative and still life pieces. The finalists works will now go on to be exhibited in the 21st National Open Art Exhibition at The Bargehouse Galleries, Oxo Tower Wharf on Southbank in London this Autumn. The Oxo Tower Wharf is an award-winning, landmark building situated on the riverside walkway part of London’s fast moving South Bank and Bankside areas. This vast, untouched four-storey industrial building is a wonderful destination – home to over 30 innovative contemporary design studios, shops, cafés, bars and restaurants with breathtaking river views – and so well worth exploring. A programme of events will be taking place during the exhibition with collaborations between NOA Vice President Gavin Turk and Deborah Turk’s House of Fairy Tales along with Be Smart About Art, Explore Learning and more to be announced. The 21st National Open Art Exhibition opens at the Bargehouse Galleries, Oxo Tower Wharf Southbank London | 17 – 26 November 2017. 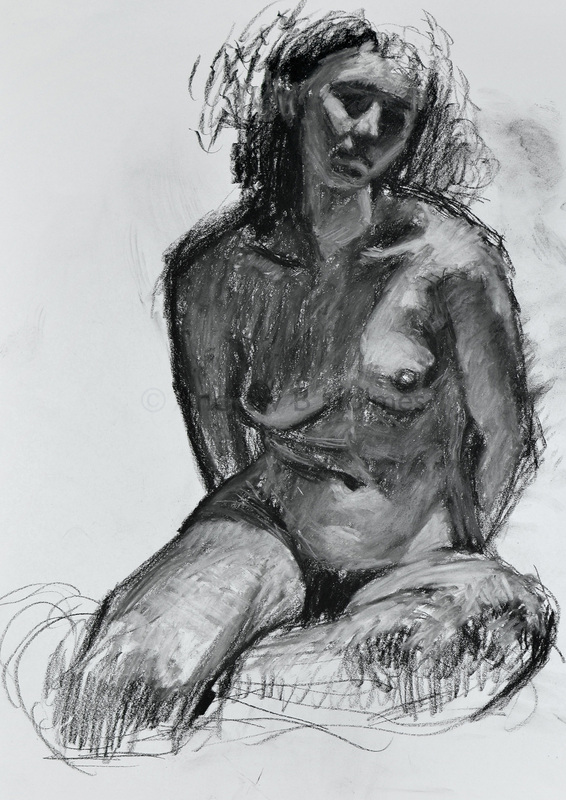 Over the past few months, Andrew Holmes has been further developing his figure drawings. When possible, Andrew enjoys joining a life drawing group as this provides an opportunity to share the same space and ideas with other artists. Based in West London, the sessions attract an eclectic and multinational group of people from a wide variety of professions and backgrounds. All have varied styles and skills and nobody is there to cast judgement. Short five or ten minute poses start the evening off, allowing the artists to focus. Andrew says it is helpful initially to look for the basic shapes when time is limited. These are very useful short studies and frequently this time restriction can produce livelier work than the longer thirty-minute sessions. In addition, models can adopt more challenging poses over a short period without drifting from their initial position; holding a physical shape over a half hour requires a sitter to have considerable stamina and the artists appreciate this. Some models are students or budding actors who use the sessions to help build confidence, but others choose to sit for drawing purely because they share an interest in art. Andrew’s practice is centred on an interest in painting and a curiosity in how contextualisation influences our perception and intellectual judgement of art. These sketches form part of the preparatory work he hopes to discuss in more depth soon.